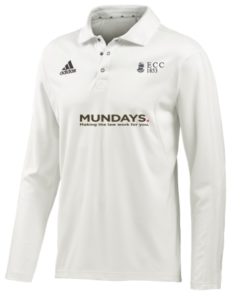 New Kit Available For Purchase | Effingham Cricket Club. · Visit the club website where you will be able to view the whole range of kit on offer. · Click “Purchase from club shop” under the playing shirt you want to buy. This will take you to the Effingham page of our kit supplier, All-Rounder Cricket. · Purchase and confirm your order to Ryan – treasurer@effinghamcc.co.uk – you can do this by forwarding the receipt email as proof of purchase. Make sure you quote your name in the email. Ryan will refund £10 in cash next time you are at the club. · Mundays will then be invoiced by the club for £10 per item. Note – this subsidy is limited to one £10 claim per person. If you have any queries about this please do let us know. We would really like all senior members to purchase a new shirt – if your finances make this difficult, please get in contact by return.